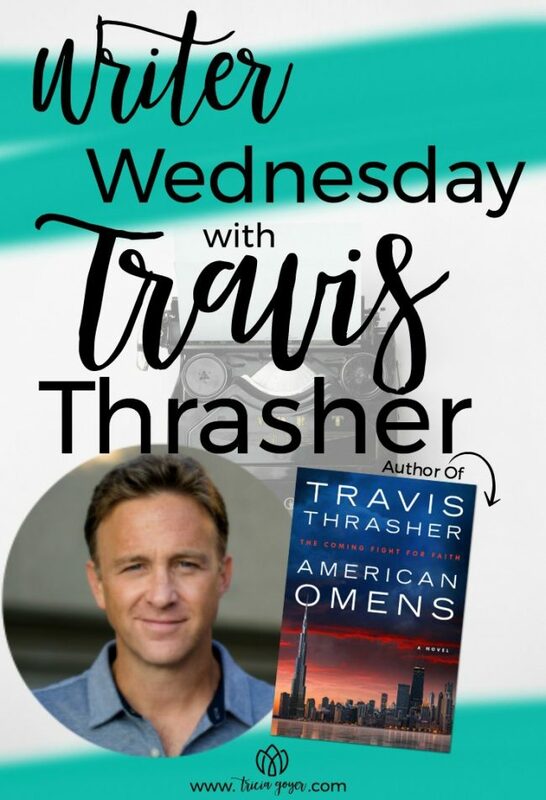 Today on Writer Wednesday we welcome Travis Thrasher, author of American Omens. Enter below for a chance to win a copy of American Omens! Winner announced right here next week. Congratulations to, Nicole Cook, the winner of Lindsay Harrel’s The Secrets of Paper and Ink! Please e-mail my assistant Christen with your mailing address! Note: This post contains affiliate links. 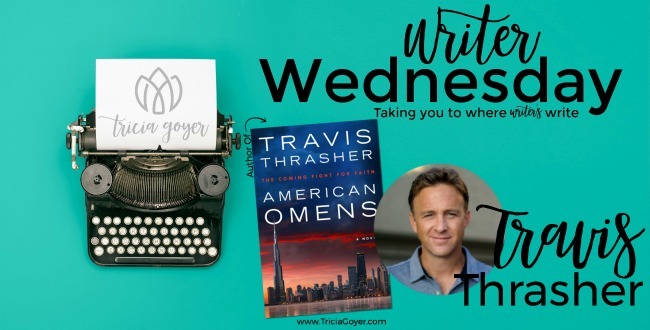 Travis Thrasher the author of the new book, American Omens, shares his writing space on today’s Writing Wednesday! Back in 2010, we discovered our family of three would be growing to a family of five. Yes, we were expecting twins. This was when I decided I needed to get an office out of the home. For seven years, I leased an office from the fine folks of Batavia Enterprises. Even when I was a month or two behind in paying rent, they were patient with this writer who got paid infrequently. When we made the decision to move to the Grand Rapids, Michigan area in September of 2017, the biggest change for me wasn’t moving into a new house. It was having a home office once again. Yes, our three girls were now full-time students, but there are these things called snow days and sick days and siestas and, oh yeah, summers. Not to mention the 45 holidays they all get. To be honest, I love having an office at home. No, I don’t wear sweat pants all day. Even though I have a nice mahogany executive desk I found in a thrift store a few years ago, I still write at the massive particleboard desk I received as a wedding present from my parents. I’ve written every single book I’ve ever had published on it, so I guess why stop now? 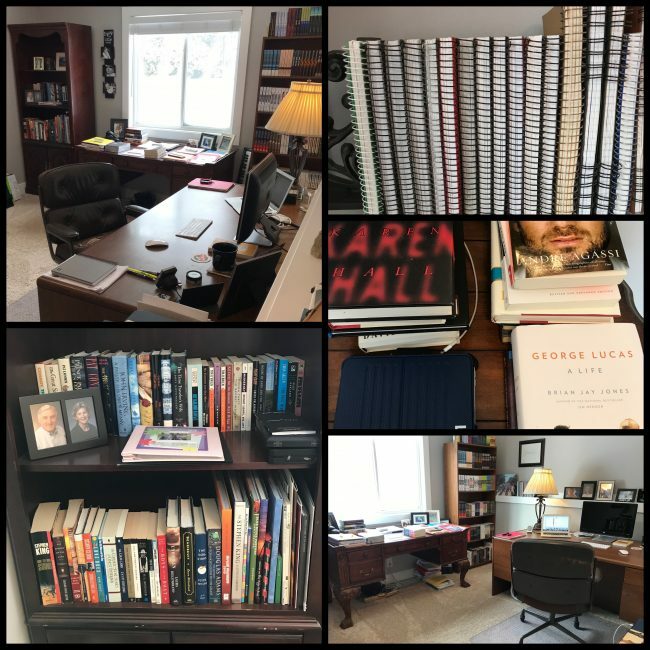 I have many books surrounding me, and hundreds more on bookshelves in our storage area right next to my office. Since I write a variety of different types of books, I’m always referring to a variety of resources (fiction, nonfiction, children’s, etc.). The spiral bound notebooks are my writing journals I’ve kept since 2002. They both inspire and motivate me whenever I look back through them at the goals, ideas, and plans I have each year. If you closely examined my office, you’d find lots and lots of folders. Every project I start, whether it has a contract and a due date on it or not, has a folder. I do the same on my Macbook. It’s good to have written and printed pages to refer to while working on a book. The view out the window is wonderful. Even though we’re close to lots of stores nearby, our backyard faces a property with thick trees, making it seem like we’re in the middle of the country. Our house has become kid central during warm weather. I often will hear our girls laughing and screaming with the neighborhood kids. It’s a sound I’m grateful to hear. Travis Thrasher, author of new book American Omens. 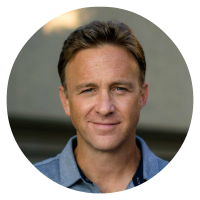 Bestselling author Travis Thrasher has written over 50 books, spanning genres in fiction, nonfiction, and children’s literature. His inspirational stories have included collaborations with filmmakers, musicians, athletes, celebrities and pastors. His novels are as diverse as the people he’s worked with, ranging from love stories to supernatural thrillers. Publishers Weekly said, “Sara and Ethan are two of the most real and sensitive lovers to grace the genre” when reviewing his first novel, The Promise Remains. They also stated “Thrasher demonstrates a considerable talent for the horror genre” in a review for Isolation years later. His readers have enjoyed the unpredictability of his novels, whether it’s due to a unique style such as second person or a twist they never saw coming. 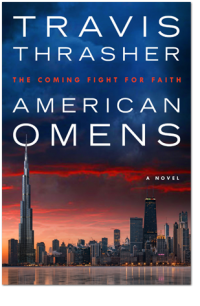 American Omens, new from Travis Thrasher. In this taut thriller that imagines a near-future America following the decline of the Religious Right, where the Christ-followers who have anticipated a rising intolerance for their beliefs for decades find out they’re right after all. In the US in 2038, a secret society is imposing its agenda on outspoken Christian leaders, killing when necessary. Corporate regulations restrict religious expressions and policies. A recent convert, Hutchence, uses creative and guerilla-like techniques to spread the Gospel of Jesus. This enigmatic man enlists a rag-tag group of individuals to help him proclaim a warning to the rest of the country: God is sending his judgment on our nation, and his first act will be to destroy Chicago. One recruit is a young and talented computer analyst who specializes in mastering algorithms for corporate and political use, and who is on the run from the company she works for, while trying to discover the truth about her father’s mysterious disappearance. Another is a conspiracy-theory-junkie & survivalist who has discovered proof of assault on people of the Christian faith. And a father with three girls is recruited by this mysterious Hutchence to help lead a return to God in America. Sounds like a fascinating read! Thank you for the chance to win. This really does sound like an exciting read and a timely one as well. Thank you for the chance to win it and the introduction to a “new to me” author.